It's 8 p.m. Friday and the historic Towne Theatre downtown is sold out. About 500 moviegoers have crowded into the three-screen movie house, paying up to $12 a ticket to watch not the latest Hollywood blockbuster but instead the premieres of three Indian movies that are opening simultaneously in India. Tonight's showcase feature: the Tamil action thriller "Aadhavan" starring hunk Surya Sivakumar, who enjoys rock-star status among fans known to break out in cheers when his image appears on screen. As couples, parents pushing children in strollers and bands of young men stream into the 81-year-old theater, past the concession stand selling popcorn, mango juice and Indian fruit bread, an employee of the film's distributor is showing his gratitude. He hands out doughy sweets called laddu, wishing patrons a "Happy Diwali" in Tamil, a salutation of the Hindu festival celebrating the victory of good over evil. "If you go to the AMC theater, they don't play South Indian movies. This is our only option, " said Sudhakar Desireddy, a software engineer for Cisco Systems Inc. and a Towne Theatre regular who sometimes attends showings twice a week. "There are so many Indians here. . . . The demand here is huge." Welcome to one of the few bright spots for the stagnant U.S. movie theater industry: Indian cinema. As the Indian film industry has mushroomed - surpassing Hollywood as the most prolific producer of movies - distributors of Bollywood and regional Indian films have been eager to broaden their global appeal, especially in the U.S., which accounts for as much as 70% of their movies' foreign box office. The U.S. has a fast-growing and affluent population of Indian Americans: about 2.5 million people. The Bay Area alone is home to an estimated 215, 000 ethnic Indians, many of whom work in the Silicon Valley's high-tech industry and are hungry for entertainment from their home country. Hoping to cash in on that appetite is Big Cinemas, India's largest movie theater chain. Big Cinemas is a division of Reliance, the Mumbai-based conglomerate controlled by Indian billionaire Anil Ambani that is also bankrolling Steven Spielberg's DreamWorks studio and that also owns the Burbank postproduction house Lowry Digital. 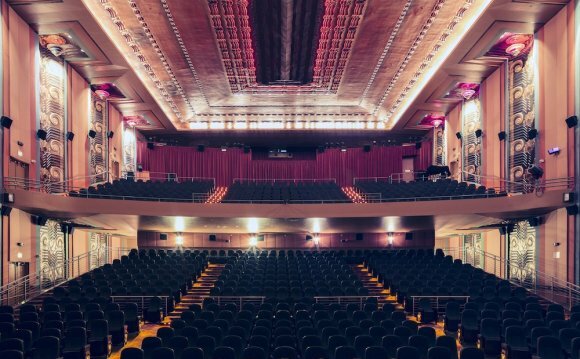 In the last 18 months, Reliance has quietly assembled a group of 18 theaters around the country, with most offering a mix of Indian and Hollywood films and some, like the theater in San Jose, exclusively featuring Indian movies. The company now operates 181 screens in the U.S., ranking as the 25th-largest theater operator in the country. Big Cinemas' goal: to build the nation's first theater circuit catering to Indian Americans and other ethnic groups passed over by the major chains. It plans to open half a dozen more theaters targeted to Indian American audiences in Los Angeles - it already has a theater in Norwalk - and in Seattle, Dallas, Houston, Miami and Tampa, Fla..
"What we found is that there is a critical mass of audiences in the U.S., but they are underserved, " said Uday Kumar, who oversees Reliance's Big Cinemas operation in North America. "We saw an untapped demand."